The school infirmary is on the ground floor of the LFKL, near the kindergarten. 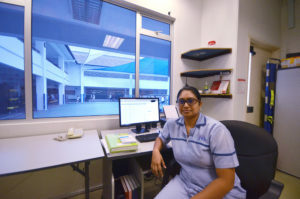 Our nurse Mrs Gosalai Dorai Raju see students who ask for their help for medical, relational or psychological reasons. She listens, reassures and give first aid within their competence. She intervenes and contributes to the protection of students at risk. If necessary, the school nurse send their young patients to the nearest school hospital. She monitors the state of health of the students and contact the parents. In line with the School Development Plan, she provides ongoing health education with the teachers, institutional partners and outside personnel who intervene at the school. Her duties are designed in support of the students and their school success, in partnership with members of the school community and the families, while maintaining respect for professional confidentiality and respective expertise. • From Monday to Friday, from 7.30 a.m. to 4.30 p.m.